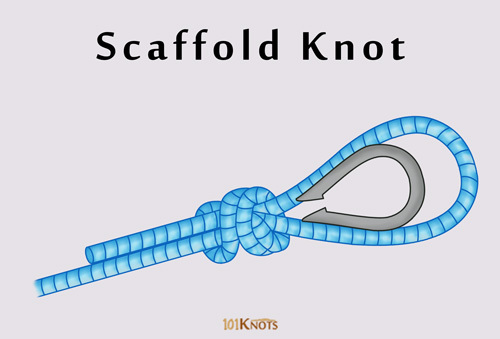 The scaffold knot forms a strong loop that can be slid like a noose to fit snugly around a rail, bar, or any other object. It is similar to the poacher’s knot with the only difference being an extra turn around the standing end. 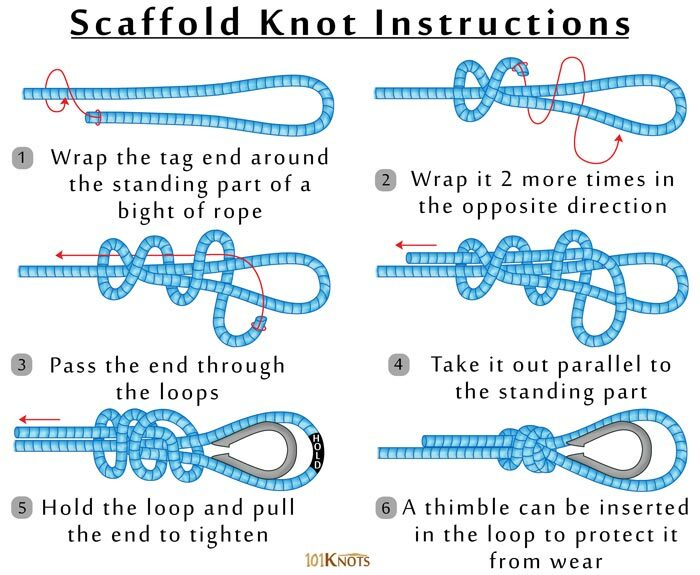 It is sometimes called by the name triple overhand noose or gallows knot while the poacher’s is also known by the name two-turn or double scaffold. Never play “hangman” with this or any other type of noose knot as it can be fatal. Its breaking strength is around 75%. You can adjust the loop by pulling the longer end. Sailors often refer to the thimble as shown in the above diagram as ‘hard eye’. It prevents the rope from chafing in boats and yachts. It is suitable for harnesses, lifelines and Bosun’s chair as it can be pulled tight. The reliable knot can be attached firmly to a shackle or carabiner making it very easy and fast to handle during climbing. It can also be used to join 2 ropes. It is used by some flathead fishermen.